Seriously Laura, this post is a little long in the tooth. Recipe please! I have been a lot of places, but never to Indonesia. I have also not eaten at an Indonesian restaurant (mainly because I don’t think they have one in my area) and if I did, I’d probably order something vegetarian anyway. But then one day, I come across this Indonesian recipe while farting around online when I should have been doing other work. I was immediately entranced. Here’s what you do for rendang. You take the typical Southeast Asian flavors and make a paste (which, in case you didn’t realize I LOVE SE Asian flavors, it must mean you are new here), sear some beef, fry up your fancy flavors, add coconut milk, put the beef back in and let it simmer half a day. 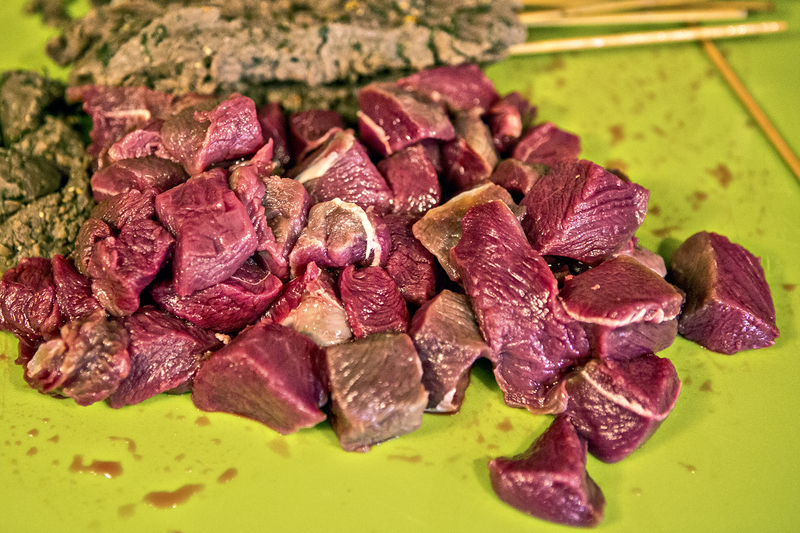 Then, when most of the liquid has evaporated from the stew-like deliciousness, you go on to fry the beef in its own fat. Holy hell. In case that hasn’t convinced you to try this dish, according to Wikipedia, “In 2011 an online poll by 35,000 people held by CNN International chose Rendang as the number one dish of their ‘World’s 50 Most Delicious Foods (Readers’ Pick)’ list.” Yep, that’s right. This dish has been officially deemed: Best. Dish. Ever. I had some venison “Thai sticks” (pictured in the back) that needed to be used, so I kinda threw them in there because they were a little freezer burned and I knew the spices in this dish would cover that up. So here it is, a slightly leaner version of beef Rendang. This dish is worth every freaking hour it takes you to make. Don’t get lazy with the “paste” part of the recipe at the beginning by using store bought Thai curry paste. All the flavors in that paste condense down and you end up with something mighty spicy and salty. Just look at all that coconut milky goodness, simmering away. Again, if you can’t find fresh galangal or kaffir lime, look for jarred versions in the Asian section of your grocery store, or in the tubes in the produce section, or go to an Asian grocery store and ask if they have it. Also keep in mind that Rendang almost always tastes better the next day, so make it ahead of time and try not to eat it all the day you make it! 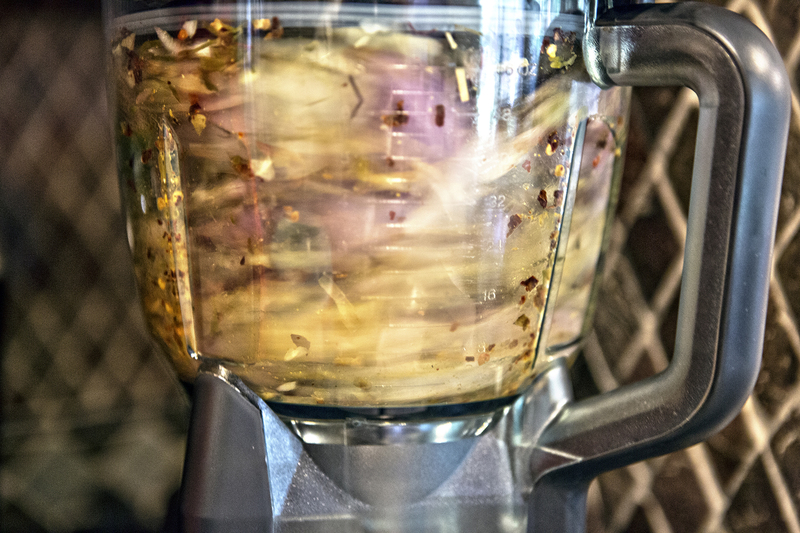 Combine salt, coriander, turmeric, ginger, garlic, shallots, chili pepper and chili flakes into a food processor and blend until there are no lumps and it's all in a paste. Add 2 tablespoons of the oil to a heavy pan and heat on medium high. Sear the meat pieces on all sides, doing this in batches taking care not to overcrowd the pan. Set aside. Lower the heat to medium-low and add the spice paste, frying until fragrant and most of the moisture has evaporated (about 10 minutes). If your paste starts to burn, lower the heat and add a splash of water. 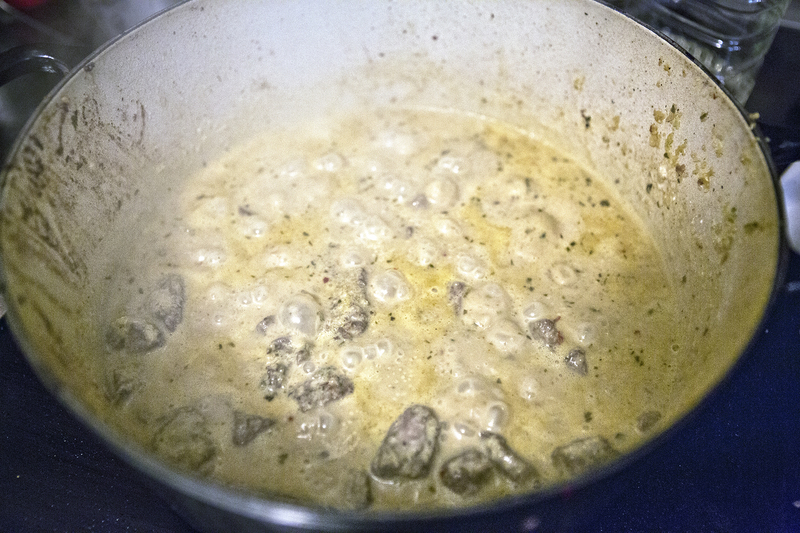 Add the coconut milk, sugar, meat, and the remaining herbs and stir to combine. Partially cover with a lid and simmer on medium low for 3-4 hours, stirring occasionally, until the meat is tender and most of the sauce has evaporated into more of a paste. Once most of the liquid is gone, turn the heat back up to medium high. Add the other 2 tablespoons of vegetable or coconut oil to the pan and stir constantly to keep the beef from burning while the remainder of the liquid from the stew evaporates. It's done when the meat is brown and there is no sauce left to speak of. Serve with steamed (or sticky!) rice. 3 Comments on "Elk Recipe: Elk Rendang"